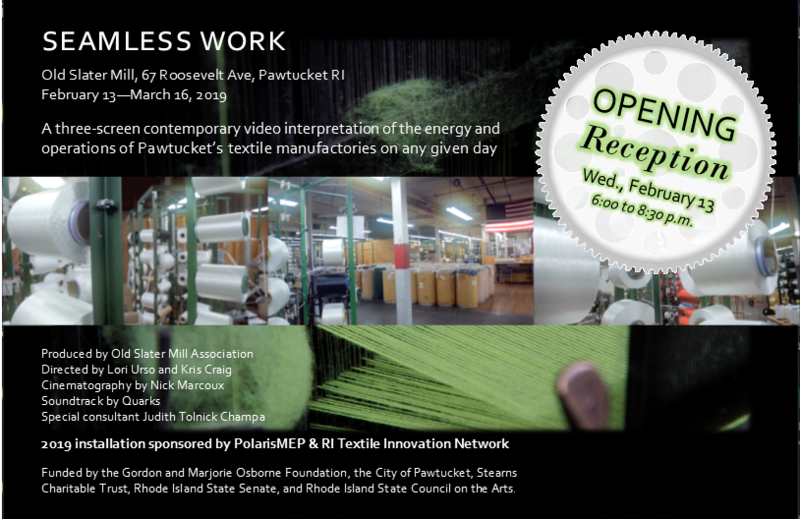 We know historically that the American textile industry began in Pawtucket, Rhode Island. But how many of us have experienced first-hand the hustle and bustle of a textile manufactory, or any type of manufacturing plant? Slater Mill opens a contemporary video installation intended to unmask some of that mystery, while delivering a stimulating, larger-than-life experience on a 24-foot, three panel screen. Seamless Work is presented as an installation of three screens, each 4.5 feet x 8 feet, projected within a black box theater installed on the second floor of the historic Old Slater Mill. The first screening and reception is Wednesday, February 13, 6:00 to 8:30 p.m. Gallery hours will be Wednesday through Friday, 11:00 a.m. to 4:00 p.m., and Saturday, 10:00 a.m. to 3:00 p.m., February 14 through March 16.